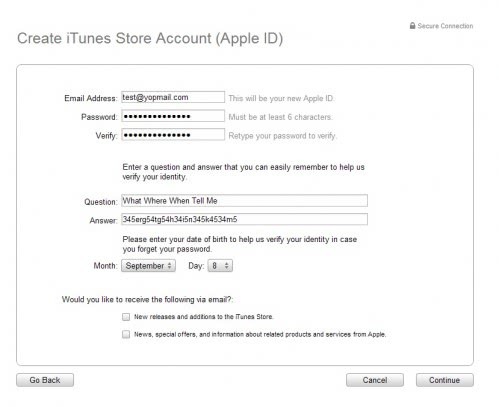 The iTunes software is performing a check when a user creates a new account to verify that the address of the user and his payment address are related. A credit card for instance would have to be from the United States as well if the user would select the United States as his country of residence. It is therefor not possible to create a US iTunes account the "normal" way unless US address and credit card are at hand. One way to get past this verification is to buy gift certificates and use them to create the account. Some users probably prefer not to pay any money for the account because they just want access to the free contents and never make a payment in the store. The good news is that it is possible to use used coupons as well to create a free US iTunes account. Gift certificates could later still be used to add money to the account in case a purchase has to be made. The benefits of having an US account are access to free songs which are updated regularly, to better promotions and music, movies or tv shows that are not available in other iTunes store yet. The first thing you do is to download the iTunes software and install it. Once that is done start it and locate the Redeem link in the top right Quick Links menu. This will load a page with a form that accepts coupons and gift certificates. All you need to is to paste a coupon code into the form and click on Redeem to send it to iTunes. Coupons can be found here or here. 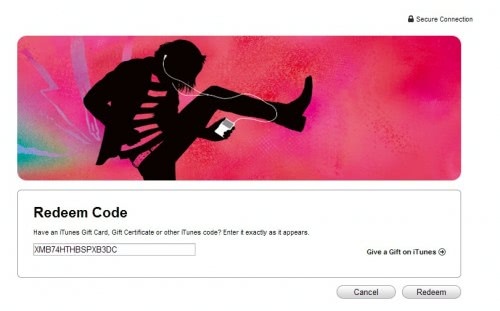 The iTunes software will throw an error message if the gift certificate or coupon is no longer valid. That however is not a problem at all. Return to the homepage by clicking on the home icon in the upper left corner of the iTunes store. Once the homepage has loaded it is time to create the account. You can do that by clicking on the Sign In button on the upper right corner of the iTunes store. It offers you login possibilities and a button to create a new account. Click on that button. Click continue on the welcome page and accept the terms and conditions of the iTunes store in the second. This finally leads to the account creation page. Enter your details on that page and continue to the next and final step of the account creation. If everything went well you should now see the page where you can select a payment method and enter the address of the account. The payment method has to offer None as one option for this to work. If that is the case choose none. 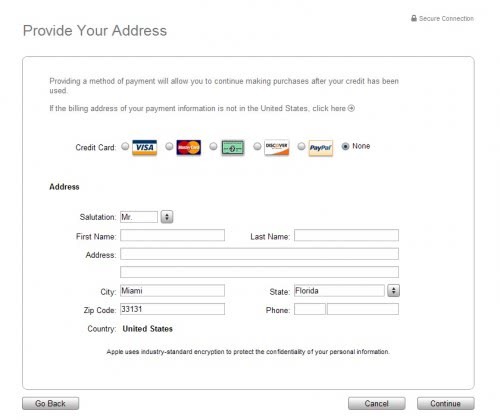 Now you need to enter an US address in the last step to create the account. The zip code, state and city have to match. Everything else does not. Just select the location of a friend or relative to be on the safe side but it is practically possible to enter any information you like. The account will be created in the last step and the contents of the US iTunes store are now available. Thankx for this informative post. WHY COULDN’T YOU HAVE POSTED IT 10 HOURS EARLIER??? I was in the same dilemma, and was thinking of the exact same thing, but I bought in to it, and purchased a $15 iTunes Card. At least I have this to turn too after the $15 is up. I’m going to find a couple of good iPhones apps and Music Videos to use the card with. Any way to do this for other countries??? I just did it without a coupon code. I couldn’t find one that worked, so I just made a new account, and had the “None” option just like your screenshot. James, a non-working coupon is just fine. Without it you will not see the None option though as I recall. Well, I tried in Brazil and it worked. But I must say, before I started it, I went all the way down in the store and changed the country from Brazil to United States. Is there anyway to do this for the U.K. iTunes store? Works brilliantly… Although the Oppenheimer Hotel in upstate NY might wonder why they have an iTunes account now. Thanks for this! Finally I can download HD content in the UK. So…. Now that I’ve done that, how do I get US iTunes vouchers? this is is silly because their is no circle near payment saying non so shut up fxxxxs. I setup a US account (I live in the Netherlands) some time ago using a gift card I bought from ebay, because I want to purchase certain TV Shows that aren’t available here (no TV Shows in this part of the planet), and it works fine. I used my brother in law’s address as he is in the US. I did notice you can use paypal these days, which is great improvement I think! Does not work from Israel. Wow. THANK YOU SO VERY MUCH! I am connected from Israel. I tried a few coupon codes until I got the “None” option in the payment page. thanks for this guide. been trying to find a way to make an account without giving my credit info. THANKS. gHacks FTW! I wanted to use the genius feature and was bummed that I had to put forth a credit card number. After reading this article, I tried a few expired coupon codes and tried to make an account anyways. The none option was there! Thanks! Redeem codes did not work for me, but the tip about downloading free iphone app was genius. Worked like a charm. I followed the steps outlined and it didn’t work well (I am from India). But following the instructions from Deal Robot it was quite easy. !!! It worked wonders! I had to try a few codes though. If you followed the steps (to reach redeem from the quick links) you can still proceed to home page and create an account. Remember to have changed the country to US and you’ll see the ‘none’ option. I am getting an “unknown” iTunes error 11111, “please try again later” when I try this trick (from Canada, on a US VPN). I wonder Apple has closed the loophole? Sadly, it doesn’t seem to work now – at least for me. Oh well. I live in CR and I configued the account on US and is up and running..
Oh i have solved a ‘BIG’ problem by your help…thankyou!!!! One question once you already establish your free iTUnes acct. will you be billed by mail or NO? it worked, but the drm-protected movies don’t work. It says “you need to authorize this computer” but even if it’s authorized with the new american account the movies won’t play. Any ideas? Please help. it’s not working after showing none option. Please enter valid Credit Card Details. will i tried ur way and it worked …i saw the none option..but even though when i filled the information and continue it returned and said : chose a method of payment!!! The “none” option does not exist anymore? U CANT CREATE AN ACCOUNT … ( ON THIS WAY ) THEY FIXED IT ! How Can You Do This In Australia?? Unfortunately that loophole has been plugged by Apple too! Now even with the FREE APP it asks for a mode of payment (even if you have clicked NONE), it shows an error message (at least in India). Can Anyone provide me a US address. I know none. TRIED THIS, WORKED, HOWEVER VERIFICATION EMAIL HASN’T BEEN RECEIVED YET ITS BEEN ALMOST AN HOUR, IVE USED HOTMAIL, YAHOO, AND AIM/AOL. ANY TIPS ON WHAT TO DO?! Every thing is fake dont belive it.. apple is monitoring it…Every thing has been solved nothing will work on itunes 8.*.*. it any body tries to hack it they will trace ur IP and Lead toserious probs. The “none” payment option has been removed from the iTunes account setup. I contacted Apple Support (I paid a bunch extra for the Protection Plan so I might as well use them! ), but they insisted that a credit card or other payment method is necessary to set up an iTunes account – so you can download FREE stuff. If anyone knows of a way to set up an iTunes account WITHOUT a credit card, Pay Pal or gift certificate, please post instructions. I tried it with 8.0.1.11 and it didnt work. It shows me the option “none” but under it, it also show me that the code i entered is not valid.I tired pressing continue but it still doesnt workk…Help anyone? READ THIS!!!! !READ THIS!!!! !READ THIS!!!! !READ THIS!!!! !READ THIS!!!! !READ THIS!!!! !READ THIS!!!! !READ THIS!!!! !READ THIS!!!! !READ THIS!!!! !READ THIS!!!!! Ok guys i found how to make a free account…in the itunes menu search iphone apps download 1 and itll ask you 2 sign in…then click create an account then the none option will be there…..
Well I don’t understand why iTunes need account for free apps and I tried 2 create account but there was not none option given, plz tell me wat sud I do to create my account ? i cant see the none either do u think u can help me?? To add to Reise’s point… If you click to download a free app or the free song of the week, that’s where the none option will appear. it does not work anymore does it? the none thing dosent show can anyone help me? I wasn’t aware that you needed a gift certificate to open an iTunes account? an i borrow any of your accounts please? I need my login and password. I need to change my I tunes account to a different computer. If you do not see the none button on when you make an account you first have to click one of the free apps on itunes and click download then a log in pops up and create an account then you have a none button. Would my iTunes account be process without a payment via credit card? IT WILL NOT SEND ME THE CONFIRMATION CODE???????? I need an I tunes account please. it will be greatly appreciated. hope it works for u! ESTOU TENTANDO TAMBEM , GRATO. THANK YOU REESE…MAY god be with u AMEN!!! i tried but it didnt work there is no none i cant see the none either do u think u can help me?? I don’t understand why I only get this function when I make a new account. Thanks to apple, my itunes store account is on my hotmail, while all the rest of my apple stuff is on another e-mail adress. Great. Thanks. THIS DOES NOT WORK! TRY ANOTHER! Thanks for the information but in the last step, it does NOT show “None” option for the type of payment in itunes 9.0.1.8.
mine doesnt have the none option…wat do i do…pls help?? I just got a gift card from http://iTunes-GiftCards.com and redeemed that, and everything works great. I download quite a bit of TV series, so the $55 is used pretty quickly! If you still are having problems setting this up, just use the step by step instruction here http://iTunes-GiftCards.com/FAQ Good luck! to make an account without a credit card, just try to download a free app and when it says log in, create a new account. this allows you to have the “None” Option. 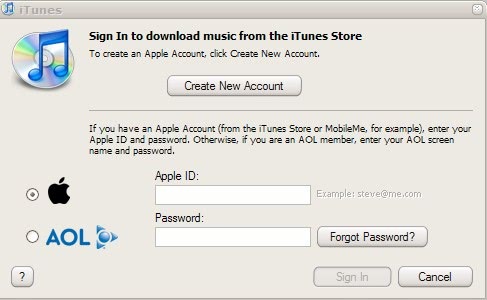 to make a specifically US itunes account, install Hotspot Shield before you open itunes. i hope hair soon of you thank you. Great service, give it a try if you don’t find what you need in your local iTunes store. I am From Bangladesh……….iam Also Can’t Connect in Itunes:( so plz Get me iDea What can i do????? not working anymore.. they will still ask a valid Redeem code after you choose NONE..
Hay people this way is awesome and easy to use but I have not used it my friend has and he says it is easy I just got an Ipodtouch!!! I wish more people would write sites like this that are actually interesting to read. With all the fluff floating around on the internet, it is a great change of pace to read a site like yours instead. How can I adjust the screen resolution on my iphone? 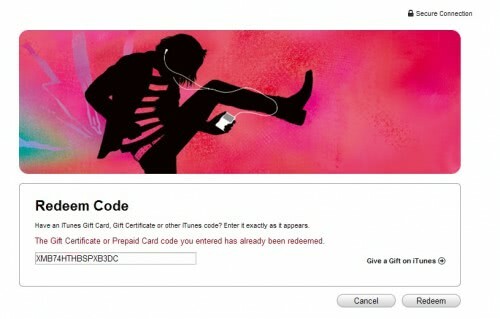 What’s the purpose of entering the iTunes voucher code? Works from Australia… used cardmummy.com to get the actual US iTunes code. they have a straight forward FAQ section for setting up the account, pretty much like this one. it’s IMPOSSIBLE to put music on an ipod nano.